The Internet in Cuba: Could Google provide Internet access in Cuba? Eric Schmidt and other Google executives traveled to Cuba where they met with members of the Internet community and the government. Google is providing Internet access in a few US Cities and is considering others -- might they provide Internet access in Cuba? Cuba has very little domestic backbone infrastructure, but they could afford to extend Internet connectivity via satellite. Google has satellite projects that could serve Cuba. Of course, both governments would have to agree for Google or any other satellite ISP to connect Cubans. I believe that, if the Cuban government would agree, the US would as well. But, the Cuban government has feared the Internet since the time of their first IP connectivity in 1996. At that time, there was high level debate about the Internet. The hard liners, led by Raúl Castro, argued against the Internet while others argued for a "Chinese" approach of supporting Internet use while censoring content and surveilling users. 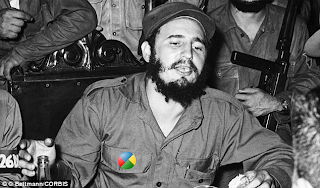 (It seems Fidel Castro was ambivalent). The hard liners won in 1996, but what about today? Schmidt reports that a "number of the people" he spoke with said "the eventual model of Cuba would be more like China or Vietnam than of Venezuela or Mexico." If some of those were young government officials, there may be a glimmer of hope. It is noteworthy that Jared Cohen, Google's Director of Ideas, accompanied Schmidt on this trip -- before joining Google, he was a member of the Secretary of State's Policy Planning Staff and served as an advisor to Condoleezza Rice and later Hillary Clinton. MIT Media Lab founder Nichlas Negropont gave a TED talk summrizing his work over the last 30 years. He concludes with his plan for the future -- using stationary satellites to connect the "last billion" -- the poorest, rural people -- to the Internet. (That part of his talk begins at 17:05). He mentions that he has partner in this project -- might it be Google? And so my plan, and unfortunately I haven't been able to get my partners at this point to let me announce them, but is to do this with a stationary satellite. 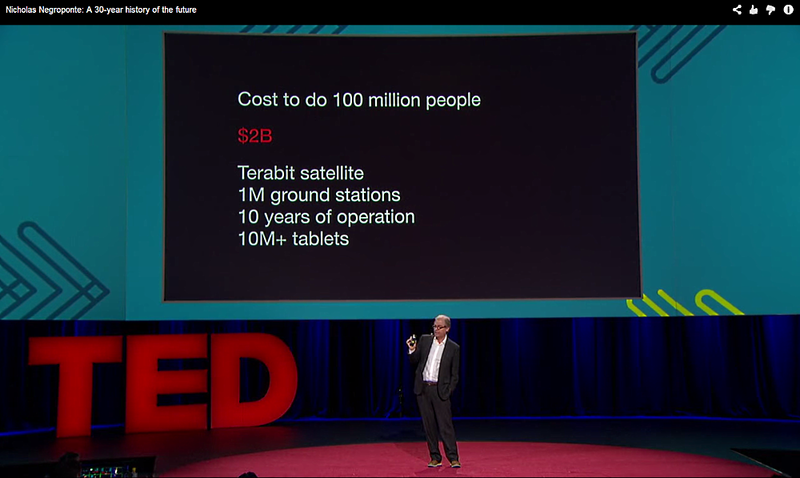 There are many reasons that stationary satellites aren't the best things, but there are a lot of reasons why they are, and for two billion dollars, you can connect a lot more than 100 million people, but the reason I picked two, and I will leave this as my last slide, is two billion dollars is what we were spending in Afghanistan every week. So surely if we can connect Africa and the last billion people for numbers like that, we should be doing it. I have suggested satellite connectivity as an interim step for Cuba on the way to a modern internet, but, might Google bring a Google Fiber-like project to Havana if it were not for political barriers? They are providing fiber connectivity in Kampala, Uganda -- why not Havana? But, even if they provided a fiber backbone in Havana, how would the end users in homes and offices be connected? Google may be working on an answer to that as well -- they are experimenting with high-speed, short range wireless connectivity.